“Israelites” by Desmond Dekker plays as we see a contrast between Barry’s morning with and then without his speed. At Star Labs the team is trying to figure what to do to get Caitlin back. Cisco is able to ‘vibe’ what is happening using Jay’s helmet; Zoom is holding Caitlin at his lair. However, without Barry’s speed, it doesn’t seem like there is anything to do to save her. Wells is less than helpful, as he is angry about the whole situation. He never fully agreed with going through with giving Zoom Barry’s speed, and now he sees what a mess it’s made. He’s heading out to find Jesse who he was able to track since she (and others from Earth-2) vibrate at a different frequency. At Zoom’s lair we see Caitlin as a captive of Zoom, but he claims to care too much about her to hurt her. He goes further, saying he loves her and someday she will love him again too. He then releases her from the shackles and gives her the freedom to explore the lair after he zooms off. She then finds both the man in the iron mask and Killer Frost. 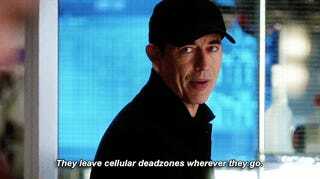 At the precinct, Wally pays Joe a visiting, asking about the Flash. Wally says it doesn’t take a genius to realize that when Zoom took him and said that someone Flash knew cared about Wally he was talking about Joe. Flash was also on hand at his street race when Iris got hurt, and when King Shark attacked the house. He doesn’t realize who it is yet, but he wants Joe to introduce them. Joe says he doesn’t think he can now, but doesn’t outright say no. Meanwhile, Wells finds Jesse’s apartment. He wants to sweep Jesse away for her own safety, but she doesn’t think she will be any safer with him and she blames him for her being in danger in the first place. She says she can’t yet forgive him for all the things he did under the pretext of keeping her safe. While Wells is driving away, his van is attacked by a Meta who then takes him hostage. At Star Labs, Barry is acting emo and watching a news broadcast about how petty crime has risen and the Flash is no longer present. Cisco then gets the alert about Wells’s crash and they pull the dash camp footage. Barry heads out to try to find him, even without his powers. Barry and Iris head to the scene of the car crash and see the signs that it was a meta that likely caused the crash and took Wells. Barry then decides to recruit Jesse to help find him. At Zoom’s lair, Killer Frost is getting under Caitlin’s skin. She then proposes a deal with Caitlin: if she can get her out, then Killer Frost will help her down the side of the cliff so they can both escape. Caitlin agrees and tries to figure out how to free her. Killer Frost and her then compare their life stories and we see how different they really are. Griffin Grey is the man who took Wells, and he wants him to fix what the particle accelerator did to him. Grey has super strength, and accelerated aging. He says either Wells helps him, or he dies. At the lab the team regroups, and Cisco is able to pull Grey’s prints from the van. They also figure out that the kid has something that causes accelerated aging. 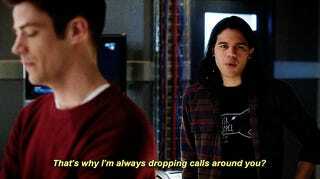 Jesse gets to work to figure that out, Barry does some actual police work, and Cisco, well, does Cisco. Further proof that Jesse is the new team MVP here. Wally goes to visit Joe again, and is adamant about wanting to meet the Flash. He says he’s been reckless his whole life, but only faced his own mortality when Zoom took him. He says he really needs to thank the Flash, because he gave up his powers to save him-a guy he doesn’t know-and no one has done anything like that for him before. The team finds that Grey broke into Ace Chemicals, and Barry and Cisco are off to check it out with Joe meeting them for back-up. They come face-to-face with him and realize the hard way accelerated aging isn’t the only byproduct of his meta powers. He uses his super strength to throw heavy containers at them, eventually resulting in an injury to Barry. After the team breaks up, Iris stays behind to comfort Barry. Barry reminisces about the first time he used his powers to save someone. It was while on a walk with Iris when a car came at them after he woke up from his coma before he even knew his potential. Wells is mixing up something for Grey as he goes on about how Wells ruined his life. Caitlin’s contraption to break Killer Frost out of her cage goes as planned, and she’s able to weaken the glass enough to shatter it. After she’s out the Man in the Mask starts tapping again. Then Killer Frost attacks Caitlin with her powers, complaining that people from Earth-1 are so gullible. She then says she realized the reason Zoom kept her is because she looked like Caitlin, and now he won’t need her. Zoom arrives and kills her, proving her right. So, do you think there will be side effects of Zoom phasing through Caitlin? At the labs Cisco isn’t having much luck finding Wells, until Jesse is able to track him using the signal from the watch he has that detects metahumans, and he’s being held at Central City Amusement Park. Then Cisco breaks out the updated speed suit for Flash, which includes an infusion of dwarfstar alloy for further protection, but there was only enough to cover the chest portion. Wells finishes the serum he was working on for Grey. Grey isn’t buying it though, and realizes he has just been playing for time diluting the compound that Grey stole from the lab. That’s when the alert sounds that the team is there. Flash gets in the first few punches, and Joe and Cisco draw his attention so Flash doesn’t take too bad of a beating. The plan works though, and the more Grey exerts himself, the faster he ages until he dies and once again looks his age. Jesse runs to free her father, and they both apologize. They both return to their ‘home’ at Star labs. Wells confesses that something in him broke when her mother died, and then when Zoom took her he snapped because he couldn’t bare the loss. She says that she can forgive him, if he promises not to be that kind of person anymore. Joe takes Wally to the rooftop of Jitters to meet the Flash, and leaves the two of them alone. 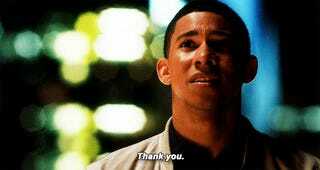 Wally thanks the Flash, and says that he will never be able to repay the Flash for what saving him cost him. He says he’s not going to waste his second chance. At Zoom’s lair, Caitlin is again chained up. Zoom says that she should be grateful to him for killing Killer Frost because she tried to kill her. Caitlin says she just wants to go home. Zoom says that they can return there, as this Earth has already been brought to it’s knees. He will stop counting his success by the number of victims, and start by the number of earths he has conquered. Barry is down on himself again, and Wells attempts to comfort him. Barry is depressed because while they were able to take down Grey without his powers, he doesn’t think that they can get Caitlin back without them. Wells says it’s time for him to start helping more, to atone for what he did. He says he can help Barry get his powers back, with a second particle accelerator explosion. So, first things first who do you think is going to get speed powers from this attempt to give Barry back his powers? Barry, Jesse, and/or Wally. Honestly I think something goes wrong and Barry doesn’t but one or both of the other two do, causing them to be the ones to fight Zoom for a bit at least and then Barry gets his back later. This was an interesting take on Griffin Grey, who’s alter ego was just “the Griffin”. He was originally a friend of Bart Allen, the fourth Flash. He also kidnapped Jay Garrick to try and cure him of his accelerated aging. Ace Chemicals was another nice Easter egg, tied to the origins of the Joker, as well as ties to other Bat-villains. BTW: Chronicles of Cisco (which is an excellent tumblr page) has branched out to YouTube for those interested.